I remember watching Dr. J play in some of his final all-star games and how the other players would talk about how much they appreciated the Doctor and what he meant to the game of basketball. Guys like Magic and Bird would comment on how he transformed the game and how he was a major reason why they had such a passion for playing. Dr. J was not only an incredible player on the court, but a great ambassador for the game off the hardwood as well. You never really questioned why Dr. J was in an All-Star game well after his prime. That brings me to Allen Iverson and Tracy McGrady. 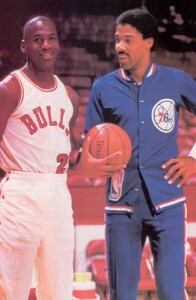 These two guys should not be mentioned in the same breath as Dr. J nor should they be in this year’s all-star game. Iverson, though an incredible talent, has never gotten rid of his me first attitude and will always be remembered for his “where talk’in bout practice” rant from years ago. It’s really a shame too, because he easily is one of the 10 best players over the last 15 years and was even a league MVP. He pretty much put the Sixers on his back and carried them to the NBA Championship where they eventually lost to the Lakers and Shaq and Kobe. That being said- he still does not belong in the all-star game. The fans continue to show their ineptitude when it comes to all-star voting and David Stern should finally take the fans out of the equation. I’d take some time to evaluate the possibility of McGrady being voted in as a starter, but his game recently doesn’t even justify me wasting my time. Plus, he’s barely played this year.